Below are some details on the children's program. Please fill out the children's registration form and bring it with you when dropping of the child. Click here to download the registration form in pdf. This year at the Pearls of Paradise Conference, we will also be having our annual Children’s program provided on Saturday November 10, 2018 & Sunday November 11, 2018. Please fill out the children’s registration form and bring it with you when dropping off your child. Registration for the 9:00 AM workshop will begin at 8:30 AM on Saturday and only the first 50 children to register *each* day will be accepted. However, please remember the children’s program will begin at 9:00 AM. 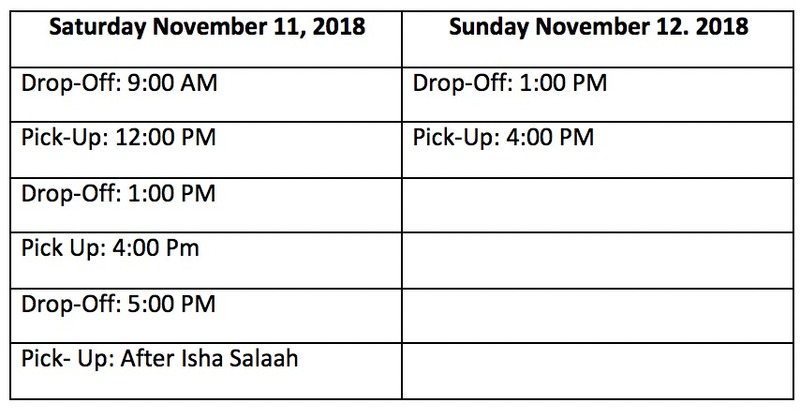 Please see below for Children’s Program drop off and pick up times. Please remember to pick up children on time. We hope to see you there insha’Allah! **Please note that children's program during the parenting workshop is being offered for children ages 3 and up. During the sisters program and the main program the children's workshop is being offered for children ages 5 and up.